Simply put it is about flying large scale gliders around a triangular course where the turn points are not marked by pylons or flag men but by pre programmed GPS co ordinates. Each model is fitted with a GPS unit linked to a vario and transmits back to the ground via either the return channel of standard model radio telemetry or a stand alone system. The data is collected by specialist software running on a PDA or other device and displays the course, the models position on the course and as a bonus (and essential for racing) up to 40 parameters about the model, its glide angle, speed wind drift and a host of other data. 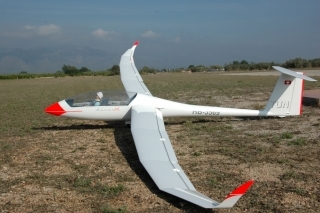 3 classes exist, the "Sport" class is open to any self launch glider with a max wingspan of 5m and a max take off weight of 7 kg, the 1/3rd scale class where the model has to be a 1/3rd scale replica of an existing full size glider and the open class which as the name suggests can be any scale model up to a max weight of 25 kg. A sub category is an open model with a self launch capability. The goal is to fly as many laps around the course as possible in 30 mins. 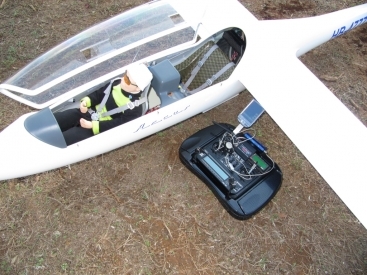 Models are aerotowed to height and have to pass across a line at less than 500m altitude (400m for the Sport class) and at less than 120 kmh as verified by the GPS data. From that point the pilot is free to fly where he or she likes to find lift to complete as many laps as possible. The best current glider will only fly less than 4 laps in still air and will be on the ground in less than 15 mins so finding lift is essential for a good score. Tactics play a big part in reading the sky and deciding when to stop to look for lift and when to push on around the course. The triangular course measures at 2.41km per lap (1.81km for the Sport class) with the first turn point 500m (350m for Sport class) away from the start line. The second point is 500m (350m)at 90 deg to the start line and the third point 500m (350) in the opposite direction to turn one. The course is always flown left hand and the turns have to be rounded in order. Rounded is not strictly correct as extending out from each turn point is 2 radiating lines each set at 45 deg forming a sector. A turn is considered to be taken if the model passes into this sector. If at the end of the 30 min time period 2 or more models have the same number of laps then the model with the highest average speed is deemed to have won. 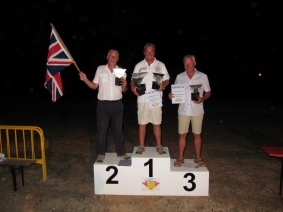 John has been competitivly flying in GPS Triangle contests since the begining of 2012 and has been quite sucessful Winning the Spanish round of the Eurotour Contest in 2012 and coming second in the Open class of the GPS Challenge Cup at the end of 2012. In 2013 John took part in the World Masters and came second overall. Not a bad achievement with less than 2 years experience and in only this third ever head to head competition. In 2016 John became World Champion in the Sport Class with a world best flight of 16 laps. I suppose with a title like that I should first explain a bit about what GPS Triangle racing is all about. 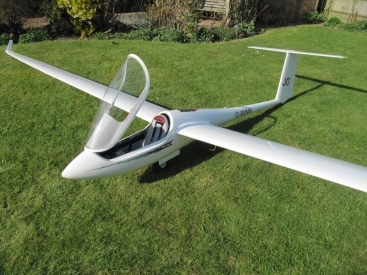 2 classes exist, the 1/3rd scale class where the model has to be a 1/3rd scale replica of an existing full size glider and the open class which as the name suggests can be any scale model up to a max weight of 25 kg. A sub category is an open model with a self launch capability. The goal is to fly as many laps around the course as possible in 30 mins. Models are aerotowed to height and have to pass across a line at less than 500m altitude and at less than 120 kmh as verified by the GPS data. From that point the pilot is free to fly where he or she likes to find lift to complete as many laps as possible. The best current glider will only fly less than 4 laps in still air and will be on the ground in less than 15 mins so finding lift is essential for a good score. Tactics play a big part in reading the sky and deciding when to stop to look for lift and when to push on around the course. The triangular course measures at 2.41km per lap with the first turn point 500m away from the start line. The second point is 500m at 90 deg to the start line and the third point 500m in the opposite direction to turn one. The course is always flown left hand and the turns have to be rounded in order. Rounded is not strictly correct as extending out from each turn point is 2 radiating lines each set at 45 deg forming a sector. A turn is considered to be taken if the model passes into this sector. With 1100 miles to drive from my home to the event near Tortosa in Spain an early start was necessary to arrive fresh and ready for the week long competition. I packed my trusty mini motorhome with my 1/3rd scale Ventus and my open class ASH 31 and it was off to Dover. I crossed the channel Thursday evening and camped in the docks at Calais ready for the long drive south. Up bright and early I set off for the Spanish Border and after a short stop to have a look round the Millau Bridge stopped at the last Aire in France just short of the border that evening. Another overnight stop and it was the last 300 miles into Spain and the event site. I woke to the sound of heavy rain and as I headed south it got worse and worse. Roads were flooded and several times it was raining so hard I just had to stop as driving was impossible. Every time the rain eased a bit I pushed on but was soon seeing flooded rivers and fields. I had programmed the given coordinates into my sat nav but as I closed in on the location it was clear something was wrong. Instead of the flat olive groves I had been told about I was in a mountainous area. When the sat nav said I had arrived I was clearly in the wrong place!!! It was a very rural area, and still raining as hard as ever so there was no-one about to ask (not that I speak any Spanish). I eventually found a café and after lots of arm waving and talking to everyone in the place I was none the wiser as to the correct location. Drastic action was called for so I rang home and got the given coordinates typed into Google maps by Tony from my Team (Ghost Squadron) and he got the same result as my satnav. I parked up for a brew whilst Tony trawled the internet until he had located the correct coordinates for the site and it turned out I was 60km too far south. A long trek back down the mountains and back along the autostrada got me close to the correct location but I still could not find it. More calls and eventually after a detour through an olive grove I found the site. Turned out the sat nav was in decimal and the cords were in deg/ min/sec. Oh well another lesson learnt. I did arrive in time for a German hosted dinner of sausage and salad and after the long journey it went down well with some German beer. I retired to my motorhome and tuned in the telly to see that the whole region had been hit by a massive storm with houses washed away and unfortunately 8 people had lost their lives. I was grateful to have arrived all in one piece. With the rain still pouring down it was off to bed dreaming of a better day tomorrow. I woke on the Sunday to blue skies and no wind. Was this finally the Spanish weather I had been hoping for? After a good breakfast it was time to assemble my H Model ASH 31 and try my hand at flying in the big skies this region is famous for. Sunday had been set aside as a practice day before the competition started for real on Monday. It gave everyone a chance to get some flying in and size up the opposition. It also gave the tug pilots a chance to get into the habit of pacing their climbs to drop the gliders off at the right height and in the right position relative to the start gate. The morning started slowly but I was keen to get a flight in early to settle down and get accustomed to the site so I got my model to the start line and prepared to launch. No sooner had I launched it seemed that everyone else launched as well and we were straight into a full blown competition. So much for easing in with some practice flying!! Not being one to turn down a challenge I took up the cause and went for it and turned in a not unrespectable 7 laps. It should be noted that 7 laps in the typical UK weather would have been a very good flight. When everyone had landed I found out that no one had done more than 7 laps so clearly all that practicing and reading about tactics I had done in the last year had done me no harm at all. On the next flight I managed 8 laps as conditions improved and then one pilot landed after flying 11 laps. This seemed impossible and then another pilot posted 11 as well. It was then my turn to launch again and conditions seemed good so I pushed in some down trim to fly faster and used the camber changing flaps to speed up through sink and slow down in lift to try to fly without circling. I was flying faster than has ever been possible in the UK without being in a steep dive and the course took on a whole new perspective. Turn points came up much faster and more finesse and accuracy was required. The level of concentration was much more than I have ever experienced before but at the end I had also flown 11 laps and to my surprise I had the fastest speed. Time for a cup of tea and a sit down. I watched the top pilots making their flights and trying to absorb everything I could. I flew again later and returned another 8 lap score. At the end of the day I was pleased to find myself 3rd overall behind 2 pilots who had flown 12 laps. Not bad for a day that was supposed to just be a low key practice session. Roll on tomorrow. The day started with a briefing from the contest director where it was explained that a pilot could make as many flights during the day as he liked but only the highest scoring flight from each pilot would show on the daily rankings. There would be a winner each day and the final placing would be based on the best flights from each pilot for the whole week. This brought into play some interesting tactics, watching the sky to read the best time to launch and keeping an eye on what everyone else was doing. The good thing was that if you launched into bad air you could go again later. The downside of this was that pilots would have to attentive at all times and be ready to fly when the conditions looked right. I decided to get an early flight in just as I had done yesterday and found some good air and scored 7 laps. Another pilot launched part way through my flight and only scored 2 laps so clearly reading the sky, and a bit of luck, was going to be required for a good score. I flew 4 times during the day and ended up with a best score of 10 laps. It was interesting to watch other pilots decisions and on more than one occasion a pilot launched into bad sinking air. The record for the day was 0 laps. There was so much sink that the pilot could not even complete 1 lap. At the end of the day all the scores were posted and I found that my 10 laps were good enough to have won the day. Next best was 8 laps. Not a bad first day. Day 3 started cloudy and could have gone one of 2 ways. Cloud cover could have built up killing good thermal activity or it could burn off to leave another clear day. There was lots of speculation as to what would happen but in the end neither was right and a sea breeze came in during the afternoon and the air went flat. I had some technical issues during my first couple of flights during the morning with my PDA stopping part way through my flights. This was really frustrating as I was doing quite well and once the PDA had crashed any time or laps beyond that point would not count. Several pilots tried help to solve the problem but it did it again on the next 2 flights, the final time when I already had 5 laps and was at 400m flying fast. I vented my frustration by doing some aerobatics and high speed beat ups of the field before retiring to my motorhome to decide what to do. Chris Garrod came to the rescue by lending me a spare PDA and although it was all in German it was working. A quick German language training session to understand the commands and it was off for another flight as I could see the conditions were changing. I had to fight hard in every little thermal or bubble of lift to stay up but crossed the line with less the 1 minute left on the clock to make 8 laps to win the day. The final 2 laps had all been below 150m scratching for lift so it was a very satisfying flight after the frustrations of earlier. It had been a hard day for everyone as every lap was hard work working the light lift but always with one eye on the clock as spending to long circling could cost time and laps. One piece of light relief during the day came when a Belgium pilot, Evert Borer who had been navigating for me and I for him decided that we were both having problems during the morning with the sun at turn point one. We contrived a contraption made from a baby buggy parasol, a length of pipe and a camera stand to shield the sun. With this device we could fly close to the sun without being blinded. It caused quite a stir when we put it on the flightline and even more laughs when we were seen to be bending down using it as a shield, but we had even more fun in the local baby shop trying to buy the parasol as neither of us speak Spanish and the shop owner did not understand any language we could speak. Lots of pointing, sign language and laughing got us what we wanted but I am sure the shop owner had no idea why 2 grown men wanted the small parasol and a length of tube !!! This was going to be a hotly contested day with so many pilots on a similar number of laps so any small improvement in speed or flying one more lap could make a big difference to the final placings. Models were in the air all day long pushing as hard as they could and this seemed to cause a problem with those people who were using Bluetooth connections to their PDA’s. Several, including mine were having trouble connecting and I lost one opportunity to fly in good air as I could not establish a connection. There was quite a lot of discussion about the reliability of the current technology in such a busy environment. I had not experienced this sort of problem before but I usually fly alone. The air improved during the day but the thermals were small and weak until mid afternoon when for a short period the whole sky was lifting. There was a mad rush to launch but the PDA issue raised its head again and I watched the good air pass without being able to make a connection. It was during that period that the 2011 world Champion, Radim Horky flew 12 laps to win the day and beat me into second place overall. That evening there was lots of discussion about the PDA issue and a lot of interest was being taken of a new system by RC Electronics from Slovenia which is self contained and does not require a PDA or Bluetooth. This is the system Radim Horky uses and as a side benefit the display is easier to use when flying alone. On the Friday after the cup competition it was the final round of the Eurotour competition for open class self launch gliders and as I had done so well in the cup I was offered the chance to enter. This competition is flown to strict time rules with 2 pilots in a team. 4 rounds are flown with each round having a working window of 56 mins. The first pilot has to take off and complete his flight and the second pilot take off and passé through the start gate within the 56 min period. The next round starts 30 mins later so it is non stop either navigating or flying without a break. Round 1 had to be abandoned as the cloud was to low for safe flying but round 2 started on time. I teamed up with Chris Garrod as Team GB and we both posted reasonable flights. Round 2 started almost immediately with Chris going first and finding the going difficult with only weak lift. His 10.4m spam ASH 25 excelled in the light conditions and he posted 5 laps. I took off immediately after with my ASH 31 and decided not to waste time circling but to dolphin through and light lift I could find. All the practice flying in poor conditions back in the UK paid off and with careful flying I managed 8 laps whilst everyone else was struggling with 3 or 4. In the final round both Chris and I posted 6 laps whilst others struggled in the light conditions and at the end I found myself in first place overall. This was a complete surprise as I had been so busy during the day flying or navigating that I had not been paying much attention to other pilots scores. 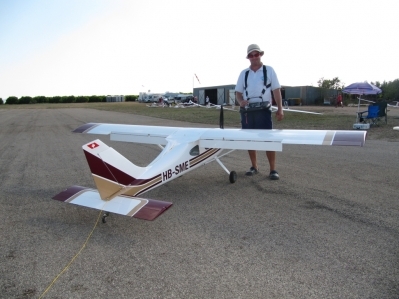 The development of modern all composite model gliders had really made this new sport practical and the performance of these models in the hands of a skilled pilot is quite extraordinary. Phenomenal glide angles and speeds are possible and even though they use aerofoils as thin as 8% they are strong and thermal well. Clearly some more development is needed in the transmission, receiving and displaying of the data from the model but companies such as Skynavigator, Weatronics and RC Electronics are all working to improve their systems to be more robust especially when lots of models are flying at the same time. Clearly this type of flying is not for everyone with the average cost of a model and equipment running into several thousand pounds but for those with a passion for large scale gliders who want to do more than just fly around it is a great sport. I am so glad I made the long trip to Spain. I have made some new friends and I am sure with several days of constant practice flying triangles and developing tactics my competitive flying has improved. Everyone involved in the organisation and all the pilots were most helpful and were happy to spend time answering all my questions about set up, trimming and tactics. I consider that to come to my first full blown competition and to end up second, only beaten by the world champion and then to win a round of the Eurotour at my first attempt was the icing on the cake. Roll on next year. For anyone interested in giving GPS flying a go, the GPS Challenge Cup is a web based competition where pilots from all over the world can fly on their local sites but log the completed flights onto the website using the unique log file created after each flight. In this way pilots can compete without the cost or time inconvenience of travel, they can pick when they want to fly and at the end of each month see how they fair in the overall rankings. 2 competitions run simultaneously, one for the best number of laps and one for the greatest number of triangles flown. All this is brought together at the end of the year to see who has done the best. If you would like any more information about this type of flying, details can be found at www.gpstriangle.net, www.skynavigator.net and www.rc-electronics.org or feel free to contact me direct. Deep in concentration preparing for a contest flight. Note the tray type transmitter with PDA attached to relay info from the model to the pilot. The model to beat in the Open Class. The ASH 31 from H Model. 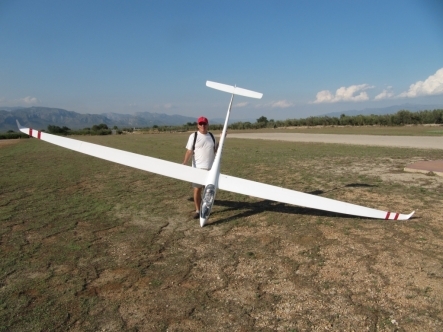 Like the full size this model has 2 optional sets of wingtips making the span 7.2 or 8.4m. model weight 23.8 kg dry or 27.8kg with full water ballast. 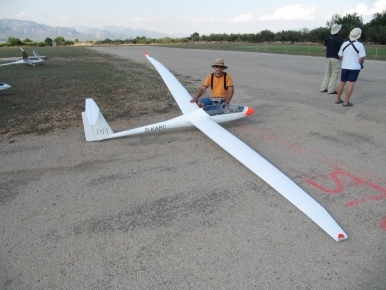 Model will self launch via a pylon mounted motor that extends and retracts through the top hatch above the wing. Peter Nemec taking his Antares out to the launch area. Notice the huge flaps, essential to slow the plane down for landing. No points for style but the author putting the parasol on a stand to good use. Notice no shadow on his face but the glare on the adjacent pilots face. It is these little things in competition that can make the difference. A standard European transmitter in a tray, note the PDA attached and the earpiece to hear what is going on. 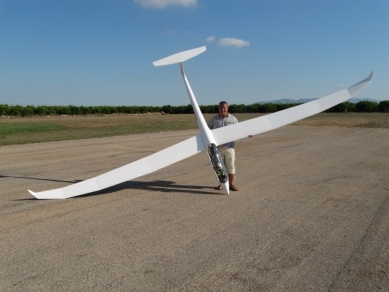 Radim Horky, the owner of H Model with his own Arcus.